The black outside border is the page (the body element). 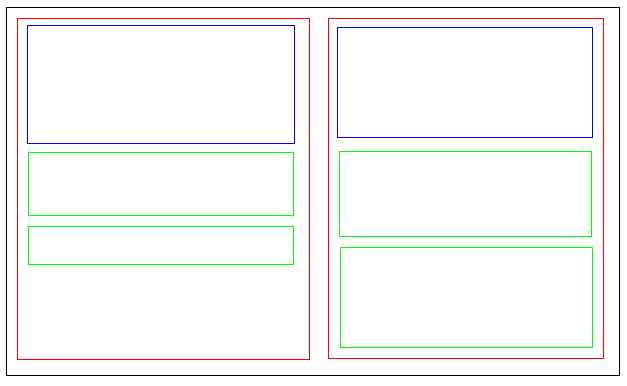 Inside are two (red) divs which are positioned alongside each other (probably using float). The two red div elements are children of the page. The body element is also a child but of the html element (the root element in HTML) which you normally ignore. The two red div elements are siblings of each other. Children of the same parent element. Inside the red div elements are some others. These are children of the red div they are in. The two green on the left are not siblings of the two on the right. The green div elements are also descendants of the body element (but not it's direct children). They are children of it's children. The body is the ancestor of all of the divs - it's children and it's descendants.